Franska elit Black Metal-bandet, med medlemmar från Seigneur Voland, Blessed in Sin och Kristallnacht, kultmaterial från 1995 finns nu släppt i en digipack med en 8-sidig booklet! 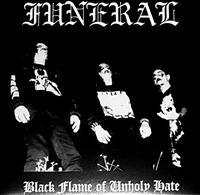 Tracks 1 to 3 are taken from the Black Flame Of Unholy Hate demo March 1995. Track 4 is a rehearsal track Summer 1995. Tracks 5 to 7 are studio rehearsal tracks Autumn 1995. Track 8 is a Mayhem cover recorded live in Toulon, France October the 31st 1995. First gig ever of Hades as session with Blessed In Sin.